Today marks the unofficial end of California's rainy season. While we may see some more storms roll through, 90 percent of the precipitation that falls across the state does so between October and the start of April. We now have a pretty good idea of how our water situation will look for the rest of the year. Just two years ago we were in the throes of one of the worst droughts in California's recorded history. The rainfall in 2017 pulled the rest of the state out of drought conditions, but Southern California continued to suffer from extreme dryness. 2018 was another knock against our recovery. Thankfully in 2019, precipitation returned with a vengeance. Most of the rain and snow we get across the state is delivered in intense bursts via atmospheric rivers. This year we were battered by a parade of storms, starting in mid January, with six in February alone. That's meant 125 percent of average rainfall for Southern California. When this year's atmospheric rivers rolled through, they were often met by cold air coming down from Alaska - which meant a lot of wet snow. Great news, considering 30 percent of our water storage is up in the Sierras and wet snow means more runoff come spring and summer. As of March 28, we've received 161 percent of average across the state. April 1 is used as a measurement because that's when snowpack is generally expected to be at its peak. During the drought California's reservoirs reached historically low levels, but luckily when 2017 came along many of them were nearly filled. This year they're also doing well with many of them at between 70 - 90 percent capacity. 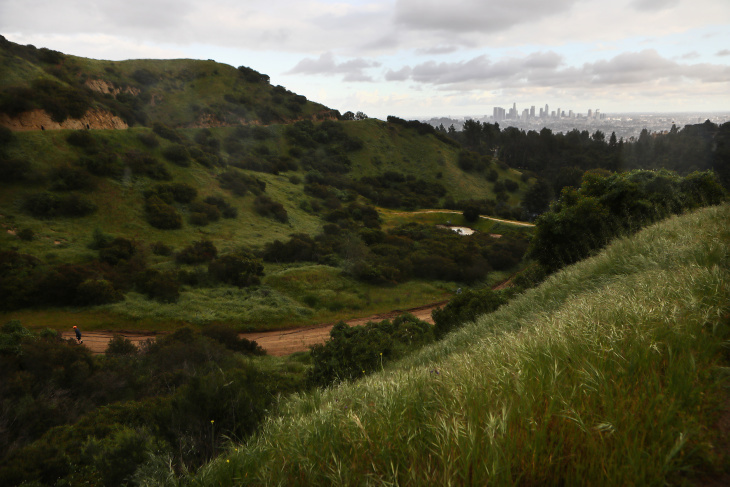 "It's a wet year!," wrote Demetri Polyzos, resource planning manager with the Metropolitan Water District, in an e-mail. "The supplies available to Metropolitan this year will exceed the demands on us. We are taking water management actions to store as much of that water as possible. We anticipate adding to our overall storage. That water will be available to the region (SoCal) for use in future dry years." The water situation is looking so good that the California Department of Water Resources increased the allocation to the central valley agricultural industry to 70 percent, one of the highest levels they've had in the last 20 years, according to Chris Orroco, information officer with the state agency. The past 20 years have done a number on our underground reservoirs. "We've not really caught up with the many years of drought we've had," said Thomas Harter, groundwater expert and professor at UC Davis. The state, especially our agricultural industry, relied heavily on groundwater resources during our dry years. 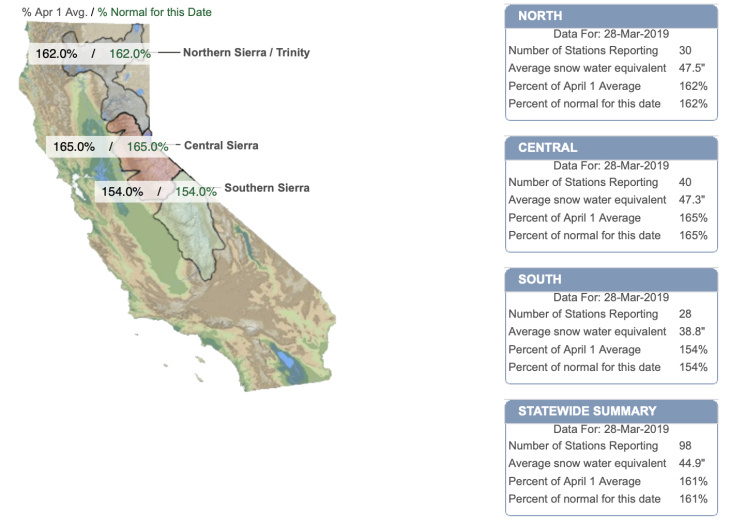 The biggest problem areas are in the San Joaquin Valley and parts of the central coast. Harter said that it takes roughly one wet year to make up for one dry year, and that since 1999, it's been dry more often than not. "Even in basins that aren't chronically overdrafted, over the past 20 years, we find that many have not really caught up in water levels relative to what they were 20 years ago," said Harter. "That's because the last 20 years have been exceptionally dry overall, compared to what it's been like over most of the 20th century." More wet years and increasingly aggressive groundwater replenishment could help. If you can predict it, let me know. It would make my job a lot easier. While we may see some additional storms, enjoy the abundance of green hills and water while it lasts. The past five years have been some of the hottest on record, which have also coincided with some of our worst fires on record. As the climate continues to change, scientists believe that we could see stronger swings between periods of extreme dryness punctuated by extreme wetness. We could slip into another dry period later this year. That's what happened after our short reprieve following the 2007 - 2009 drought. We then experienced the worst drought on record just a few years later.